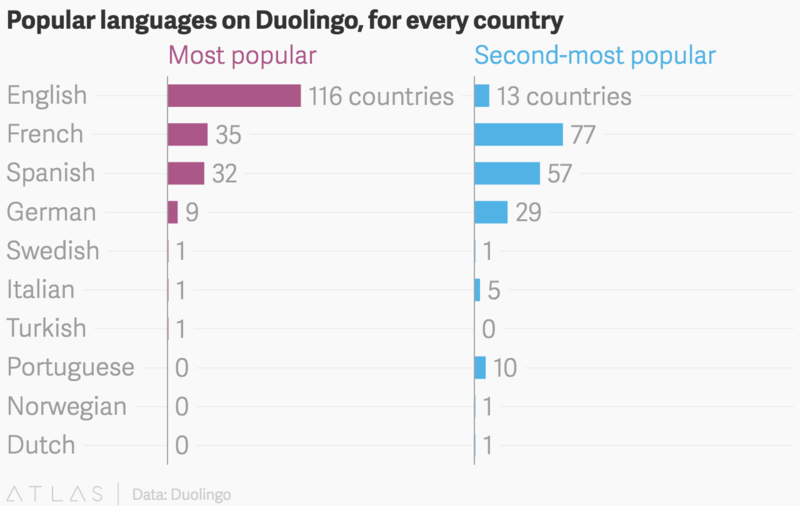 If you own a smartphone and are trying to learn a language, you probably have Duolingo . At this very moment the app—which tries to turn language learning into a rewarding game—may be not-so-subtly suggesting that you are overdue for some Spanish vocabulary practice. Duolingo recently answered such questions by running the numbers on their 120 million users, spanning every country on the planet. The company identified the most popular language for each country, among the 19 it offers. English is far and away the most dominant, with a caveat: For some learners, English is the only language Duolingo offers with translation into their native tongue. English is the only course available to Thai speakers, for example . That doesn’t change the fact of universal interest in English, though, which Duolingo notes is studied by 53% of its users. Things get more interesting when you look at the second-most popular language by country. There French takes the lead, followed by Spanish, German, and Portuguese. There are some other oddities in the data. Notice that on the map the most popular language in Sweden is…Swedish. This is related to immigration, Bozena Pajak, Duolingo’s head of research, suggests in her write-up. “One in six Swedish residents in 2015 was born outside of Sweden,” she writes. Other high-immigration countries have a large proportion of people studying their official languages, she adds, like the United States and Norway. Now time get back to the Spanish vocabulary lessons.